Stamford Talk note: Thanks to guest blogger Stephen (AKA Mr. Z.) for another wonderfully informative post! This time he brings news of soon-to-be-open restos on Summer Street. The vacant restaurants on Summer Street are starting to come back to life. Buffalo Wild Wings will be the first to open, with their grand opening coming on Saturday, April 18. Here's the good part though: The first 100 customers who eat at Buffalo Wild Wings on that day (they open at 11am) will win free wings FOR A YEAR! I've heard rumblings downtown that some folks will be getting in line mighty early, so if you want those free wings, I suggest pulling out your camping gear and spending the night out in Stamford. Should be a nice brisk mid-April night, and the memories will last a lifetime. The wings, of course, will only last for a year. Buffalo Wild Wings is replacing the (searching for nice word) disappointing La Hacienda. The only thing that place had going for it was that there was never a wait. Next door to Buffalo Wild Wings, in the old Tats on Summer Chinese Buffet, will be Mary Ann's Mexican. Mary Ann's has 3 locations in Manhattan and 1 location in Port Chester. Her website claims that the Stamford location is opening on April 16, but I walked by today and that place was an active construction zone. Sadly, they're nowhere near ready to open in a week. The reviews on Mary Ann's are mixed, but let's at least hope it's an improvement over La Hacienda. On the other side of Buffalo Wild Wings, replacing the Zinc Bistro, will be the Stamford installment of the very popular Barcelona Wine Bars, which are currently hot spots in Greenwich, SONO, Fairfield, New Haven, and West Hartford. The folks at Barcelona apparently have a personal goal to open a restaurant in every town in Connecticut. I wish them luck. Barcelona claims that the Stamford location will open in "Spring 2009", so I guess all we know is that they'll be open by June 21. There were plenty of construction workers inside Barcelona today too, so hopefully they remain on schedule. It's always good to see new restaurants opening in Stamford, even if they aren't all 100% unique. Dude, who wants free wings for a year? That's only a good deal if the beer is free too! CP -- Shhhh, you're spoiling all the fun! Mrs. Z reminded me last night that we've eaten at the Mary Ann's on the Lower East Side. So I guess I can say that based on that recollection, it should be better than La Hacienda. I love Mary Ann's in Port Chester, but I was a huge fan of La Hacienda, too--good food, cheap Tecate bottles, and always quiet. Yeah, it probably didn't need that huge space, but I miss it. I'm not psyched about BWW coming, though. Maybe it's because I'm not a huge wings fan, but I think it's mostly because I don't know that downtown Stamford needs another place that caters to the same crowd. 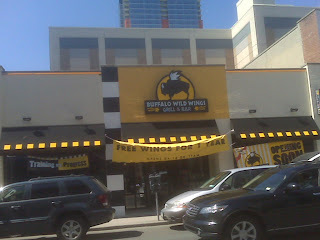 I'm just picturing a mass of guys in button-down shirts wandering from BWW ("Those are some awesome wings, bro!") to Tiernan's ("Play 'My Own Worst Enemy' again, bro!"). Stamford's downtown will be awesome when it regains a sense of adventure and distinguishes itself from New Haven, White Plains, and South Norwalk. I was never impressed with La Hacienda, but Mary Ann's has a good reputation from people who know it in other locations. Wild Wings might not make their opening day, but it will be soon. Barcelona may be fall of 2009 or not -they have a lot of work to do. Mary Ann's also has a lot of work and that may be by summer. one more item - the Peruvian restaurant will "open soon" according to the signs on the door. They did not open yet. Hey, have you seen BUtterfield 8 on Bedford. They are looking for soft open in April too. Darn! I was trying to keep the free wings thing on the hush-hush so I'd have a better shot! Then again, BWW's wings aren't true buffalo wings nor are they hot enough for me. I can verify the opening date of the Wings! They actually have had their walk through! Barcelona claimed to have everything done to the HD, but when I went by last week they were very busy working - got a gut feeling about that one. And the Peruvian screwed up, they opened and were closed cause they forgot some department in the city. Willie Nelson and Billy Bob Thornton are in Napa & Co. right now having dinner!!! One update on Barcelona, they had told the HD they were finished, the man in the know went there and guessed that maybe they are 40% and moving at a snails pace. He was unimpressed with the set-up.